Two of the most basic financial lessons your kids will have to learn are how to earn money and how to save some of it. Do your children know that the money you spend, for example, on a new car, is a direct result of the earnings you made by going to work and then saving over time for that vehicle? If they don’t, you can teach your children with these tips on the value of earning money now and saving some for later. If you don’t provide a regular allowance, that's OK. Even if you do and want to help your children score some extra cash, try using a commission system. The idea is that they earn money for the successful completion of a “job” (e.g. cleaning the kitchen or cleaning the garage) and not a routine chore (e.g. washing the dishes or sweeping the garage floor). Earning a weekly commission that’s based on work sets kids up for the real world. After all, if you don’t complete your duties at work you don’t get paid. And if you don’t get paid you don’t have a way to save for a future purchase. Wondering how you can help your child save money? Work together to set reasonable savings goals. Yet still allow your children to keep some pocket money. Help kids determine how much money they must save from their “paycheck” to meet that goal. A goal of saving $10 in a month may seem large to small children, but it’s an easy goal for teens. With the 30-Day Kids’ Savings Challenge, children of any age can save more than $100 in a month with very little effort! Also, saving doesn’t have to mean working toward a spending goal. 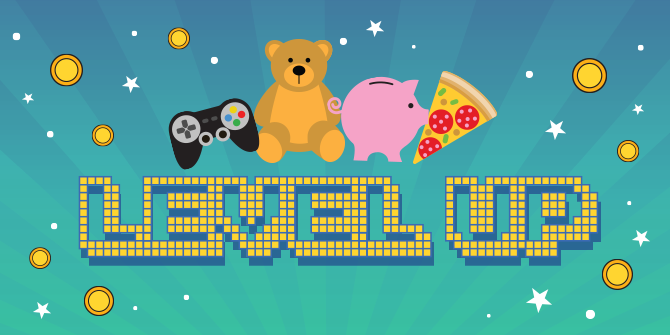 Encourage kids to save their money for no other reason than to level up their savings skills. Add their money to a dividend-earning account, like LGFCU’s Fat Cat Kids Account or Zard Teen Account. This way the Credit Union adds a little extra, which can help them save even more. Help your youngsters become savings heroes when they track their 30-Day Kids’ Challenge jar toward a fill-up! Go ahead and challenge your teens to up their ability to make and save loot. Give your children a chance to earn some and save some cash on their own. They will gain patience, discipline and appreciation for the effort it takes to pay for things. And that knowledge will offer much more valuable life lessons as they grow older. Show off your children’s savings skills on our Facebook page for a chance to win a coin counter or a $25 Visa® Gift Card. Check out the official contest rules. The advice provided is for informational purposes only. Please refer to our social media policy for a refresher on what you should or should not post on social media.